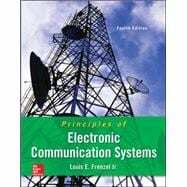 Principles of Electronic Communication Systems 4th edition provides the most up-to-date survey available for students taking a first course in electronic communications. Requiring only basic algebra and trigonometry, the new edition is notable for its readability, learning features and numerous full-color photos and illustrations. A systems approach is used to cover state-of-the-art communications technologies, to best reflect current industry practice. This edition contains greatly expanded and updated material on the Internet, cell phones, and wireless technologies. Practical skills like testing and troubleshooting are integrated throughout. A brand-new Laboratory & Activities Manual provides both hands-on experiments and a variety of other activities, reflecting the variety of skills now needed by technicians. A new Online Learning Center web site is available, with a wealth of learning resources for students.